Gennemsigt., 50 x 50 cm., 1500 kr. 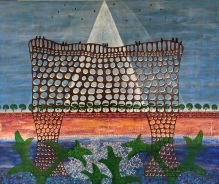 Lyserød sky, 80 x 100 x 2 1/2 cm., 6000 kr. Juli, 107 x 127 x 4 cm., 9500 kr. Joy, 40 x 60 cm., 2200 kr. Summertime, 50 x 60 cm., 2200 kr. Kelim, 80 x 60 cm., 3300 kr. End of the Rainbow, 80 x 80 cm., 4500 kr. 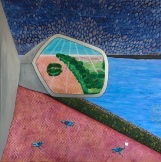 Søjler, 80 x 80 cm., 4500kr. 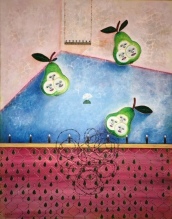 Marchè Ouvert, 60 x 80 cm., 3500 kr. Sur Maroc, 80 x 60 cm., 3500 kr. Kompos, 25 x 25 cm., 600 kr. Yin og Yang, 60 x 50 cm., 2200 kr. Up-Hill, 60 x 80 cm., 3500 kr. 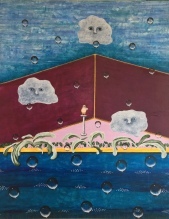 Eau de Vie, 60 x 60 x 4 cm., 2800 kr. Longing forever. 27 x 35 cm., 700 kr. 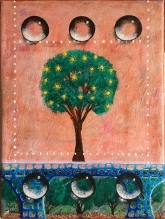 The Men in the Moon say LOVE, 60 x 60 X 4 cm., 2800 kr. 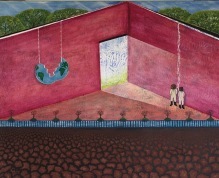 Transformation, 80 x 100 cm., 4900 kr. In the Shadow, 50 x 60 cm., 2200 kr. Eyes, 50 x 50 cm., 1500 kr. Ringe, 50 x 50 cm., 1500 kr. Free Chair, 70 x 70 cm., 3100 kr. Great White Open, 100 x 100 cm, 6800 kr. 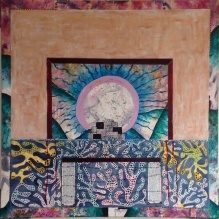 Keyhole, 40 x 40 cm., 1200 kr. To be, 40 x 40 cm., 1200 kr. Sunshine ? 24 x 18 cm., 600 kr. Free Nature I, 80 x 100 cm. 6500 kr. Free Nature II, 100 x 80 cm., 6500 kr. Free Nature III. 80 x 100 cm. 6500 kr. The Future is the Past. 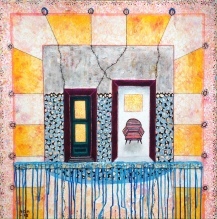 100 x 100 cm. 7900 kr. Loosing the Core. 60 x 120 cm. 5400 kr. Cradle of Life. 60 x 120 cm. 5400 kr. 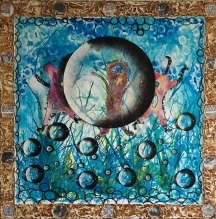 Planet Lesson, 100 x 100 cm. 7900 kr. Head in the Bush with Boots on , 80 x 80 cm. , 4600 kr.